Up on the chalk downs they call The Wold, witches are banned: ever since the Baron's son vanished in the woods. Anyway, as all witches know, chalk's no good for magic. Nine-year-old Tiffany Aching thinks her Granny Aching, a wise shepherd, might have been a witch, but now Granny Aching is dead, and it's up to Tiffany to work it all out when strange things begin happening. Up on the chalk downs they call The Wold, witches are banned - ever since the Baron's son vanished in the woods. Anyway, as all witches know, chalk's no good for magic. Nine-year-old Tiffany Aching thinks her Granny Aching - a wise shepherd - might have been a witch, but now Granny Aching is dead, and it's up to Tiffany to work it all out when strange things begin happening: a fairy-tale monster in the stream, a headless horseman, and, strangest of all, the tiny blue men in kilts, the Wee Free Men, who have come looking for the new 'hag'. These are the Nac Mac Feegles, the pictsies, who like nothing better than thievin', fightin' and drinkin'. Then Tiffany's young brother goes missing and Tiffany and the Wee Free Men must join forces to save him from the Queen of the Fairies. Narrator was very good. Really enjoyed his voices. Would be nice to have a woman do women's voices but it doesn't detract from the story or characters. It is a great story too, for children and adults. I enjoy this book so much I can’t wait until I’ve forgotten it enough to listen all over again. There are some wonderful gems of wisdom that sneak up on you while your being entertained. 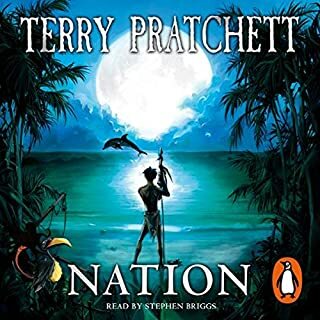 This is one of my Terry Pratchett favourites and Stephen Briggs excels with great voices for the various characters. I'll be listening to this again soon. Voices of the Wee Free Men a combination of Scottish and Swedish badly at times. another great pratchett story. a new witch in the fine tradition of disc world witches. Great for young teenagers. inspiring fantasy story of a girl who defeat the queen of fairies. This was a great pick for a bookish 11-year-old who is a big Monty Python and Douglas Adams fan. It gets the big thumbs-up from me (his mother), too. Characteristically Terry Pratchett--funny and sharp, and deceptively wise and touching in parts. Tiffany, who is 9 when this starts, is a terrific girl character: brave, resourceful and the hero of the piece. The Wee Free Men are hilarious; just part of the charm of Stephen Briggs' excellent narration. You do have to be on your game: the Men, aka Nac Mac Feegles aka pictsies, have thick Scottish accents. And Pratchett trusts his readers to keep up, rather than spoon-feeding them. For me, that makes it all the more enjoyable. I chose this hoping it would work for my 9-y-o daughter as well. She enjoyed the first few hours, but did lose interest a little, perhaps due to listening in interrupted sessions rather than on a long car journey. But the 11-y-o just loved it, and is still quoting from it. my first Discworld book ... i'm in love!! Crivens! 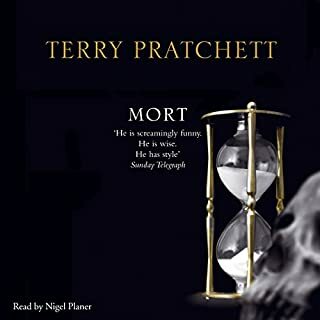 it's a shame that i only discovered Terry Pratchett works, i hesitated to read this one because it is not the first book in the Discworld series however i was assured that won't be a problem and it wasn't. i love children books and i LOVED this novel, it was interesting, charming, whimsical and funny. 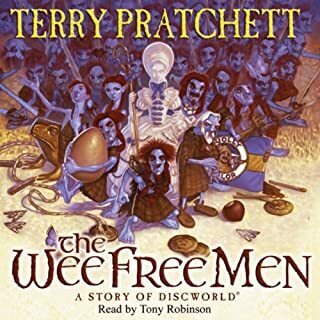 I adore the free wee men and even though English isn't my first language i didn't have much trouble understanding their Scottish accent in fact i couldn't get their accent out of my head even after finishing the book, much credit to Stephen Briggs and his awesome narrating. I'll definitely listen to it again and to the other books of the Discworld series. I already loved this book...Then I received the one illustrated by Stephen Player and I loved it even more...Now, listening to Stephen Briggs breathe life to the Mac Nac Feegles just made it all "more". I finally know what they sound like! Mr. Briggs' performance was superb. He gave distinct voices for different characters: male, female, young and old... I will be getting the other audiobooks featuring Tiffany Aching and the wee free men. Great book, loved listening to Briggs. From now on I know exactly what a Nac MacFeegle sounds like. What made the experience of listening to The Wee Free Men the most enjoyable? Really funny story, which in my opinion is his funniest! This performance did the story justice! Very very enjoyable. I laughed out loud a number of time. The Wee Free Men are really funny and have made all English into Scottish in my head today. I can strongly recommend the audiobook. Stephen Briggs has done a great job with this one! 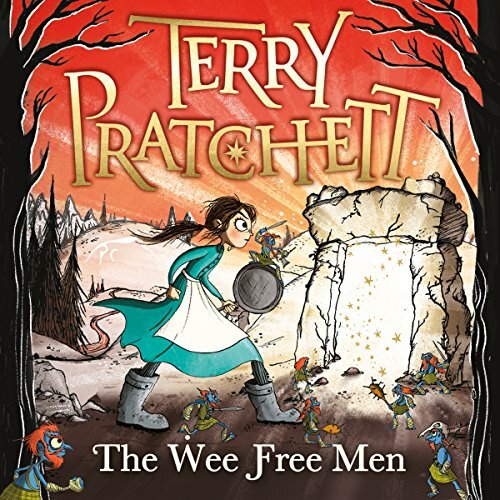 Would you consider the audio edition of The Wee Free Men to be better than the print version? Rarely do I enjoy listening to performances of a material more than actually reading the book. This was one case. The narrator was amazing, hilarious, and engaging. Quirky fun story, as most Pratchett novels are. I laughed out loud in quite a few places. Well worth the read, especially for any Pratchett fan. Great Book, Could use a bit more editing! I buy these books for my 12 year old, and am happy to have an excuse to listen to YA stories, which I secretly really enjoy. Pratchett was recommended to me, and I very much enjoyed this first book in this series. The books are funny, the characters engaging and the narration is great. There is nothing in them to worry a parent and my daughter gives it a two thumbs-up rating - "wonderful, loved-it." I did, however, find myself wondering what happened to the editor. There were mouth noises throughout this recording, which is why I docked this book one star in the overall rating. As an audiobook publisher myself, this was actually somewhat of a relief (so good to know that we all make mistakes sort of thing), and really, while it was a bit distracting, it didn't take away from my enjoyment of the book. And I do note that the second book is absolutely clean - I'm half way through and not one lip smack. If you could sum up The Wee Free Men in three words, what would they be? Have you listened to any of Stephen Briggs?? ?s other performances before? How does this one compare? His Discworld performances are very much the same - excellent. I don't think you can add much to his performance. He is a good narrator that bring the text alive as if the Nag Mac Feegle might just crawl out of your ears. 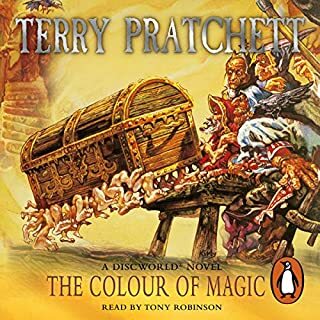 Its worthwhile to listen to, but definitely one of the Discworld novels that are not so much of a page turner. The humour is sharp, but maybe one can say same old same old, nothing much to think over... maybe that is what makes it a children's book, but I don't think children is so stupid. Great plot, links well with favourites from the main Discword novels, all ages should enjoy. The narration by Stephen Briggs is excellent, looking forward to the sequels. Fabulous story, brilliantly read by Stephen Briggs. Don't be put off by it being a 'Children's Book' either... yes, youngsters will love it, but anyone who loves fairy tales, adventures, drama and comedy will love it too. Strangely familiar characters appear and you'll find yourself in the midst of a dream world... and if you're like me, then you'll savour the end and feel a bit sad when it's finished. Terry Pratchett doesn't disaapoint in this hugely entertaining book. My son, age 10, seemed to cope with most of the slight anachronisms...what is space invaders Mum?, Why is he called Yo-less? ... and enjoyed the book. Is there a sequel Mum? easy to listen to, brilliant story, Terry is a fantastic writer and paints such a picture in your head. I discovered the Tiffany Aching series when I was nearly 60, and couldn't imagine why it was classified as a children's book. It is so complex and layered and hilarious and wise - I recommend to any adult who is still able to suspend disbelief and dive into a world of imagination. But children also love it. I just listened to the audiobook with my 9 year old grandson who grinned during nearly every paragraph and often squealed with delight. Didn't bother him in the least that the hero is a girl - although I suspect that may keep it off the list of books recommended for boys. My husband (nearly 70 and doesn't usually like fantasy) also listened and loved it for its wisdom, humour and complexity - and the absolutely fabulous reader. 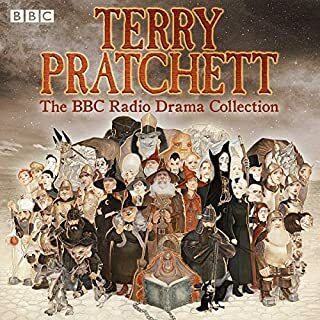 Absolutely loved this, impossible to listen without laughing out loud, Mr Pratchett's finest hour! 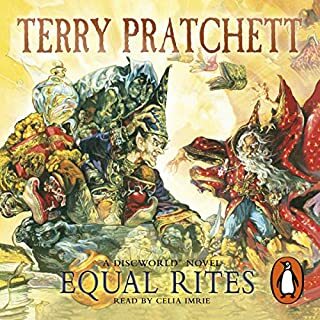 Love all the pratchett books especially the witch ones and thing Stephen Briggs is great at narrating them would definitely recommend these audio books to everyone. I love this book - it makes me laugh outloud every time I listen to it! Love the strong heroine, love the quirky story, love the wry clever humor that I find so typical in Terry Pratchett's books. The brilliant reading by Stephen Briggs brought it alive for me. Highly recommend! book is aimed at children but is a nice easy listen for adult followers of Terry Pratchett. good story line introducing the wee free men.